If you're anything like me, the first time you heard about eating seaweed, you were grossed out. But maybe also like me, every time you heard about the health benefits of seaweed after that, you got more and more curious. I used to be simultaneously scared and intrigued by sea vegetables. I never really knew what to make of them-- I love eating them in Asian restaurants, but I assumed I would never be able to recreate anything similar at home. Plus, I imagine the kelp I remember from my childhood visiting Lake Erie and I get nauseated. The intrigue overtook the fear and I started to learn about them. Did you know sea vegetables (or seaweed) are one of the richest sources of minerals in the vegetable world? They're also almost fat-free, very low in calories, packed with calcium, protein, carbohydrates, phosphorous, magnesium, iron, iodine, and sodium, and vitamins A, B1, C, and E.
Alicia Silverstone is a huge supporter of sea vegetables in The Kind Diet, and says that they do amazing things for your skin, hair, and nails, and also help to work as anti-inflammatory and antiviral agents in the body. She also says they help to reduce blood pressure. Sea vegetables also have compounds which help to remove toxins from our bodies. There have even been studies done which show that kombu and wakame binds with radioactive material in the body and therefore, inhibits tumor growth. If you share in my fascination of these veggies, you've probably noticedquite a few different types of seaweed in most grocery stores. The health benefits of seaweed vary depending on the type of algae and its concentration. 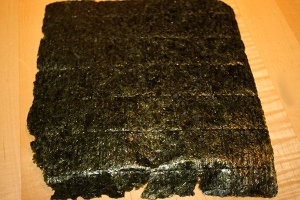 Most of us are familiar with nori as it's the most common wrapper for sushi rolls. Nori is a type of red algae that is often cultivated. It's full of vitamin A and protein, and sometimes goes by the name "laver" or "sloke." 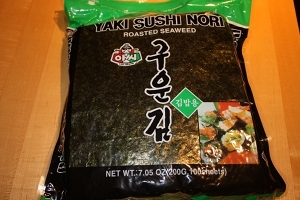 I like to keep a package of nori around for wrapping rice and veggies, making sushi, and breaking up into soups. 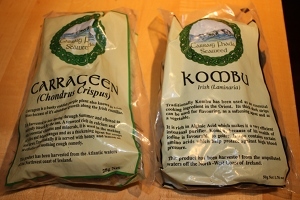 Another seaweed most of us have heard of is kelp. Kelp is often sold as dried kelp powder, and it's amazing in faux tuna fish sandwiches as it imparts a slightly fishy flavor. If you have any of the Vegan Nutritionista menu plans, you're probably somewhat familiar with agar agar. Agar agar, also called agar, works as a great replacement for gelatin in jellos, puddings, and nut cheeses. It's full of iodine, and also works as a mild laxative. I find agar agar is usually pretty expensive in health food stores, but it's ridiculously cheap in Asian supermarkets. Agar comes in many different forms, and most recipes call for flakes, so depending on the size of your flakes, the amount you need will vary. I recently made the mistake of using powder instead of flakes, and ended up with a much more solid mousse than normal. If you have a food scale, that's the absolute best way to ensure you're using what the recipe demands. Arame is often sold dried and in thin strands, and it's perfect in soups or in addition to vegetable dishes. Arame is great for you skin, hair, nails, and bones. Hijiki is the calcium powerhouse of sea vegetables with about 14 times as much calcium as milk. When it's dried, it becomes very tough (the consistency of jerky), and so it needs to be soaked before eating. 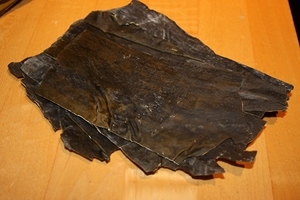 Kombu is very popular in soups, rice, and vegetables because it helps prevent them from sticking. And, because it's high in minerals, it helps make beans more digestible. Wakame has tons of protein, calcium, iron, sodium, and other vitamins and minerals. You can buy most of these at grocery stores, and especially health food stores. If you're on a budget, Asian supermarkets are your best friend. They have every seaweed you can think of, and they're super cheap. If you shared in the fear and confusion of the unknown greens from the sea, hopefully this has helped you. I think you'll find the health benefits of seaweed just as magical as I do!